The combined action of lowering the front wheel and moving your hips forward gives you extra torque and power for the pedal kick. 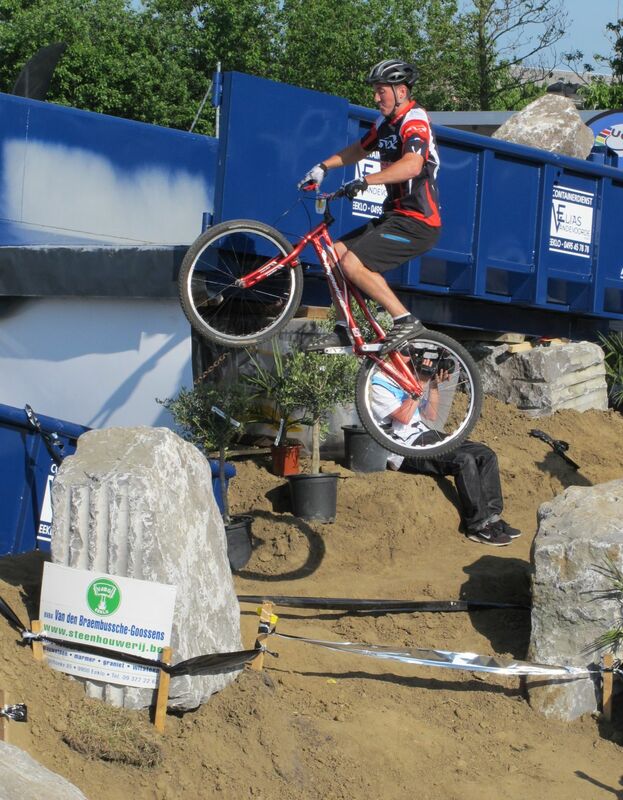 This also compensates for the vertical tilt that results from pulling on the handlebars during the jump. Carles Diaz, right on the edge, arms stretched. Aurelien Fontenoy tucks to cover extra distance. This will also prevent you from leaning too much on the rear upon landing. You can enhance the rebound effect of the rear tyre with a small hop as you drop your center of gravity, compressing the tyre precisely onto the edge as you lower the front wheel. Taking off at a slight angle, about 20 degrees from the gap instead of facing it (with your lazy foot facing the gap) allows you to kick-in more power and for longer, until you are in full extension on your front pedal. This will effectively increase your reach and extension potential. After take-off, you will also be able to swing the bike sideways, increasing your reach to land further. 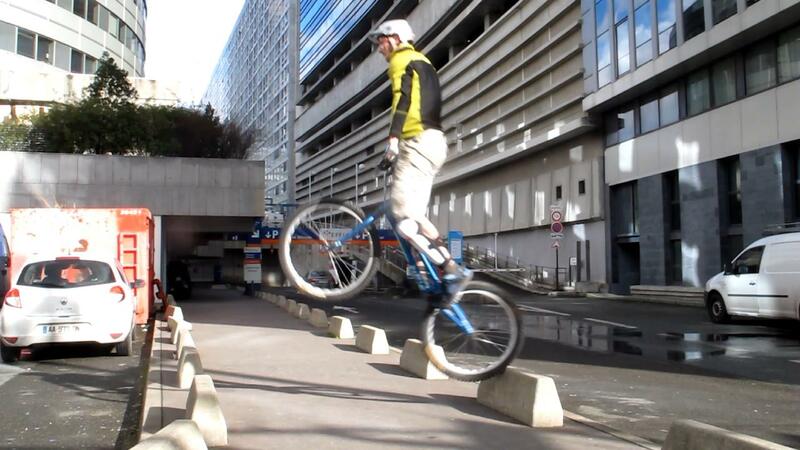 1° Balance over the rear wheel at about 20 degrees from the gap instead of facing it. 2° From a high up position, let suddenly the front wheel drop and regroup so as to perform a compression hop. 3° The rear tyre gets pinched right on the edge, you end up arms fully stretched ready to kick in the pedal. 4° Pull the bars to you and accelerate into a jump extension. Taking off at a slight angle allows you to kick-in more power. Now, a lot of beginners struggle with the pedal kick and even more so to coordinate their actions for an efficient jump impulse on top of a moving platform (the pedals). Looking at the raw mechanics helps get a clearer view of the move's dynamic. From here, one can work on improving different aspects of the move to optimize it as a whole for different situations. Probably the most important lesson to learn is that you should not consider the bike as dead weight during your jump impulse and pedal kick, but instead, use the full bike's length as a cantilever to amplify your jump, pulling the handlebars to your abdomen as you push on the pedals in an upward acceleration. To make the most of this cantilever effect (the bike's frame leveraged against the rear hub axis) and get a firm lift from the pedals, keep your arms stretched during the pull (from crouching to moving up into the full jump action). Focus on thrusting your hips up to the stem, rather than simply pulling the handlebars to your abdomen. Like if you were on a rowing boat, most of the pulling action (on the handlebars) is done through the hips and legs pushing on the pedals (a moving platform), connected to your stretched arms via a firm torso. 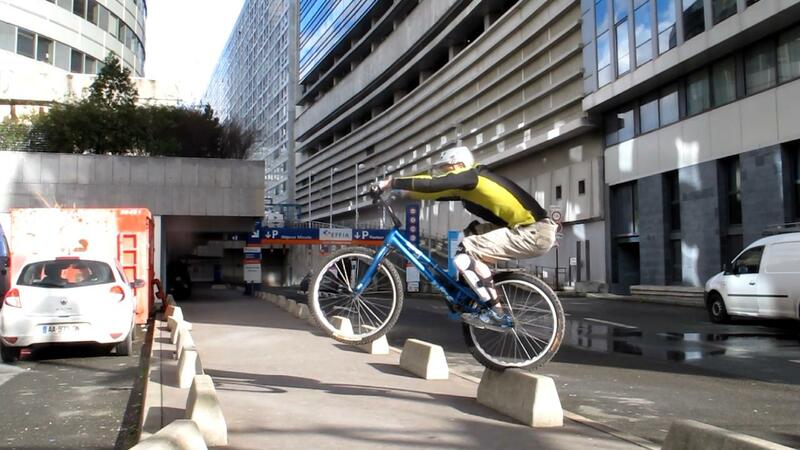 In fact, you only need to flex the arms after the jump impulse, to lift the bike off the ground. The two forces (pulling the bars to your abdomen and pushing on the pedals) are tied as a force couple through the bike acting as the rotating mechanical link. So in effect, you can pull and push as much as you can, as if you wanted to rip the bike apart, your forces will naturally be redistributed to tilt the bike up. But in the end, the faster and firmer the move, the faster the bike moves up on its rear wheel and the higher you'll be catapulted by the pedals (through the bottom bracket uplift). This mechanical amplification works great for bunny hops too. Naturally, it looks like the front leg dominates all the move simply because you want to kick and impulse a rotation to the rear wheel while keeping the pedals level for a vertical thrust, but pulling the bars to your abdomen (by thrusting your pelvis forward, stretched arms rotating around the shoulder joints) actuates the same cantilever effect to catapult you up. Your jump impulse (the whole upward extension) should be a continuum in acceleration. It starts with your hips over the back wheel, the front wheel fairly low or even on the ground (during a compression phase) with your arms nearly stretched in front of you. It ends up when you reach the maximum vertical speed at the highest point on the pedals, your hips close to the bars and your arms stretched along the body, just before you start tucking your knees and pulling the whole bike up (flexing the arms, elbows high). By keeping your arms stretched most of the time during the jump impulse, you'll transfer a more powerful torque to the bike as you push on your legs (no loss of power through arm unflex). When the front wheel is at its lowest position during the compression phase, you can use the handlebars as a pull-up bar to thrust your hips forward and effectively pull yourself up as the bike tilts up on its rear wheel. The overall direction of thrust depends on how much you counterbalance the torque of the rear wheel and how you surge over the bike. If you surge too vertically, then the rear wheel could just shoots underneath you (that's wasted forward thrust), but if you surge slightly forward, then the torque sends you flying vertically or even forward for drop gaps. 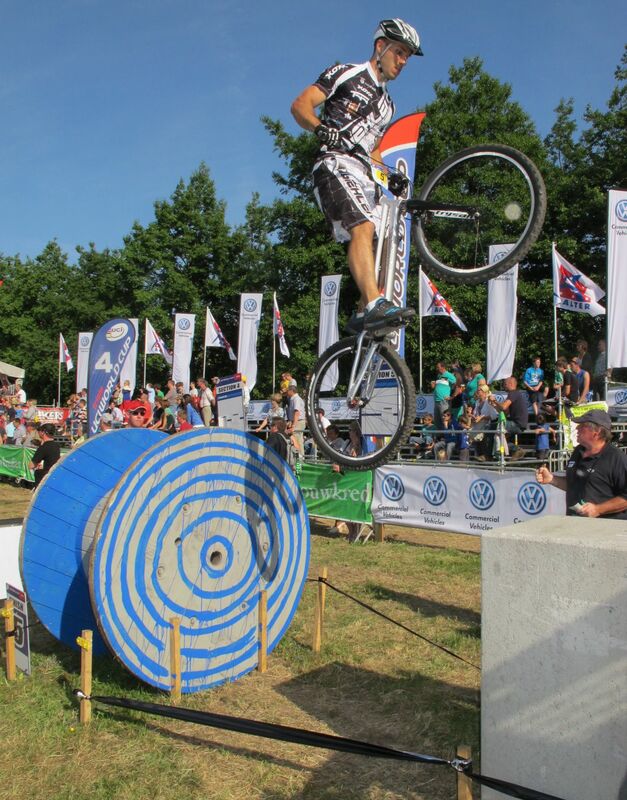 Hannes Herrmann tilts the bike vertical for a secure reception. 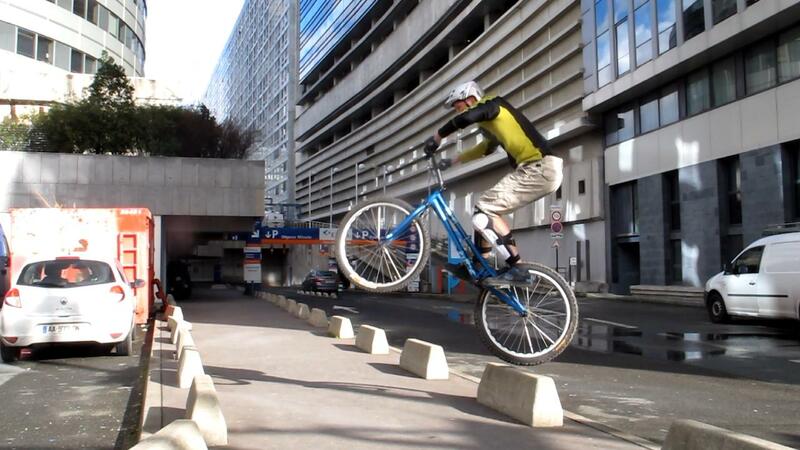 For a longer reach, tuck your knees and pull the bike up. Now that you can pedal hop, make the most of it. A correct rear wheel position can make all the difference between a face-plant and a nice powerful gap transition. When you are about to leap from a rock or a wall, a rounded or a flat edge is more forgiving, since the rear wheel will always roll off it nicely. 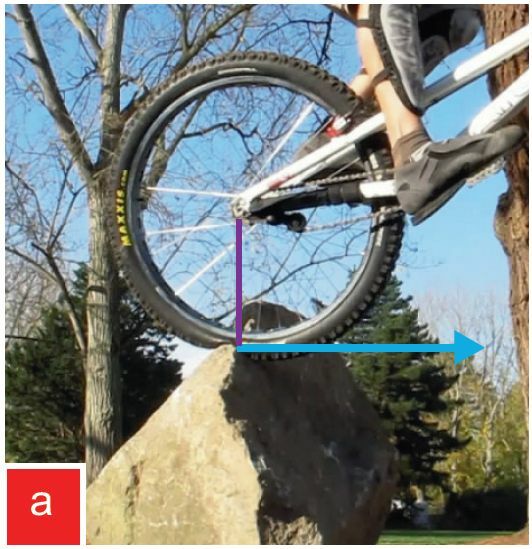 But when performing a pedal kick from a narrow edge, for example from a pointy rock or a railing, be careful to always position the rear hub right above or beyond the edge (on the gap side), like shown on the pictures (a) and (b). 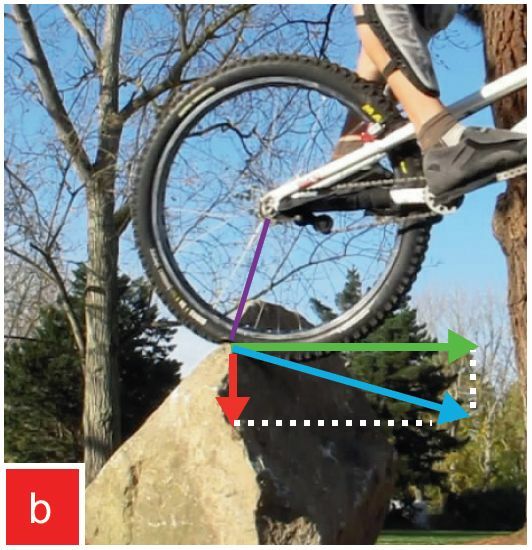 Never start with your rear hub behind the highest point of the edge (picture c), unless you want to put yourself into desperate crash situations. As you kick in your front pedal, part of your effort is transferred to the rear wheel into a torque (a rotating force perpendicular to the radius of your wheel). To simplify, if we were to consider only the rotating wheel (not your whole impulse on the rock), its reaction force (blue arrow) will propel you off the edge. The rear hub is right above the highest point of the edge, the wheel will provide the maximum torque horizontally, for an optimum gap distance. There is no vertical reaction, all your energy goes into the horizontal move. The rear hub is a bit beyond the edge on the gap side, the rear wheel rolls down and this drags the bike down while you try to tuck for the gap crossing. The downward reaction (red arrow) is lost energy and makes your jump ineficient. In the optimum case (picture a), the rear hub is positioned at the vertical right above the edge, this ensures the most kick back from the edge with a reaction force that is completely horizontal. From the kick alone, there is no vertical reaction and you will perform the longest jump. If you kick in the pedal while the hub is already standing beyond the highest point (picture b), then the reaction to the wheel torque (the force that reacts from your kick into the wheel) can be decomposed into a horizontal (green arrow) and a vertical (red arrow) components. In this case, the vertical component represents energy that is wasted downwards, that could have been used instead to propel yourself across the gap. Instead, it pushes your rear wheel down and makes it more difficult to lift the bike up. Now, this would be the right approach for drop-gaps. You can play on this roll-down effect to kick your rear wheel directly towards your targeted landing spot if it is situated lower. 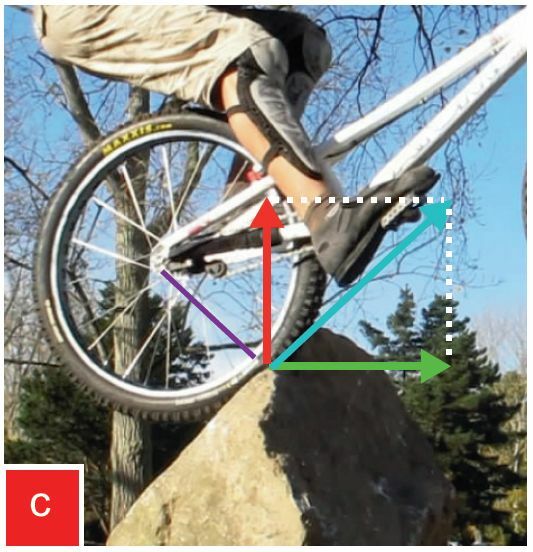 If you still kick the pedal when the rear hub is positioned behind the highest point of the edge (picture c), the reaction to the wheel torque (blue arrow) will be decomposed into a vertical force upward (red arrow) and a horizontal reaction (green arrow). That would be ok if you kept your weight behind or above the rear hub, maybe for a small re-adjustment hop to get right on top of the crest. But if you kick too hard and lurch forward over a gap, the upward reaction will flick the rear wheel up and tilt the bike down as you shift your weight forward. 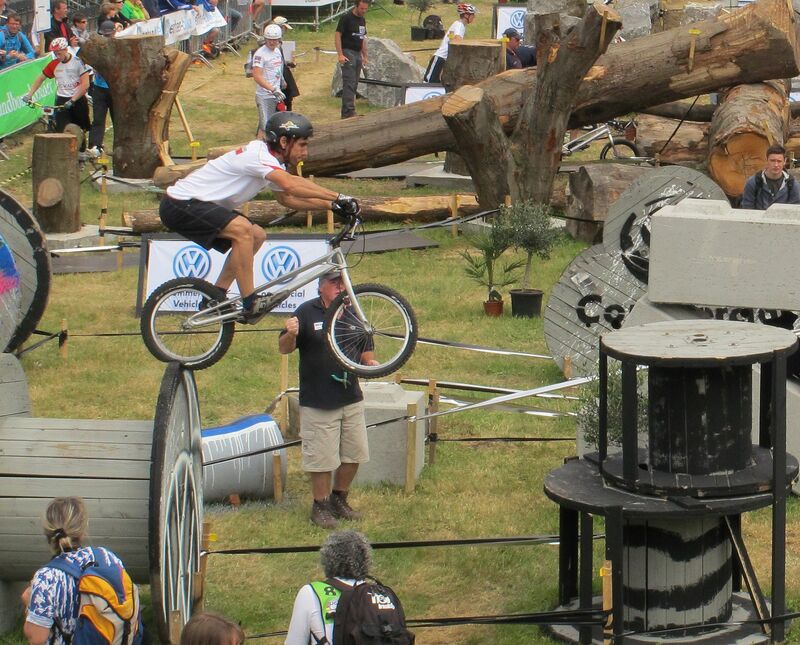 This is a sure way to plunge over the bars. Effectively, it is as if the rear wheel was stuck behind a small step, and that could be the start of a face-plant. Typically, when you are in perfect balance on the back wheel, on a rail or a pointy edge, the front wheel is fairly high up. Now, when you lower the front wheel before the kick, this rolls the rear wheel down by about a foot (with the hub coming behind the edge). That's why in most cases, the compression hop before the kick is also a repositioning hop, bringing the rear wheel back again in a good position right before the kick. If you want to avoid a re-adjustment hop, then start in balance with the rear hub just a bit behind the edge, so that when you lower the front wheel you end up with the hub exactly at the vertical to the edge (picture a), ready for the perfect kick. Try to focus on this and you'll notice a huge difference in your kicks.